Gretel Hakanson and Raj Helweg live in Tucson's Sam Hughes neighborhood with their three dogs. Raj is a helicopter pilot and Gretel works as a freelance writer. They have made their home into a working model of sustainability by installing water harvesting cisterns, solar hot water, and a 3.8 kW PV system. When Gretel and Raj were living in Seattle in 1998, they were inspired by the concept of the Earth Ship, an independent, sustainable house utilizing passive solar construction with no carbon footprint. 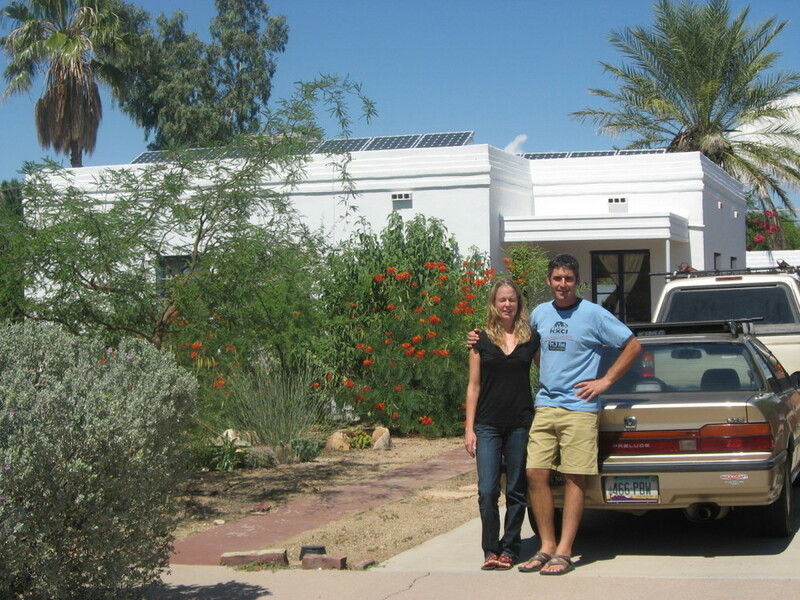 When moving to Tucson several years ago, they decided to follow the sustainability model by living in a small house located close to downtown, commuting by bike, and using harvested rainwater to irrigate their landscape. Gretel explained, “The house was built in 1940. It’s a green home on the historic register. At just over 900 square feet (plus a garage that was converted into a studio), it seemed very small at first, and we considered an addition. Then we realized that we really didn’t need any more space for just the two of us, so we decided to go green instead of going larger." Raj and Gretel were referred to Technicians For Sustainability when they were researching water harvesting cisterns with Watershed Management Group. The couple liked TFS's mission: to ensure that Southern Arizona’s natural resources are used efficiently and with respect for present and future needs. This vision resonated with the homeowners' dreams of a carbon neutral existence. As a result, Raj and Gretel decided to include solar hot water and solar electricity into the design of their home. From an investment perspective, Raj and Gretel felt that the complete environmental package made perfect sense. They appreciated that TFS was there every step of the way to help the couple navigate the state and federal tax credits and TEP's utility rebate. This allowed the homeowners to take full advantage of all available financial incentives. "The TEP refund process was painless - TFS did all of the work, and we received the check about six weeks later," said the couple. Raj and Gretel were very excited upon the completed installation: “We were monitoring our system all the time, wondering how many watts we were using, calculating our savings.” As their low-maintenance system continued to work as promised, they paid less attention to the functioning of the system and began to focus their excitement on the utility savings that were coming in every month. For the future, Gretel and Raj hope to see financial incentives for people who install solar energy systems continue. They understand that "most people operate on a month-to-month billing cycle, and generating capital is the biggest hurdle." They feel that the future of solar electricity lies in sustainable building practices in addition to effective and efficient financing models. This couple feels that steps like these would help make solar power more accessible to a greater number of people. By incorporating solar electricity, solar water heating and rainwater catchment cisterns, Gretel and Raj have significantly reduced their consumption of gas, coal and water. "Building a zero carbon footprint home is something that we still dream about doing one day, but it’s not something that’s going to happen anytime soon. So, we decided to convert our existing home into a sustainable home, as much as we could. We installed a solar hot water system, a PV system and three cisterns. Kevin helped us determine the size of system, which is producing more power than we’re using. He also provided invaluable advice on the cistern installation. Raj concluded our interview by stating, “I would recommend TFS. Not only is everyone very skilled and friendly, but they also have a passion for what they were doing. They rode their bikes whenever they came to meet with us and even when they installed the systems. I think I even saw a cup of tea being brewed by the sun one morning."